FOOD52 is a food site that, among other things, organizes weekly recipe contests. For each contest there is a theme (holiday roasts, summer desserts), a main ingredient (pumpkin, eggs ) or a type of dish (risotto, paella, pie). The only rule to participate is that the recipe you send has to be your own. Plagiarism is, of course, not accepted. The coolest thing about it is that the winning recipes are published in their annual cookbook. So this week's contest theme is alliums. Alliums? I have no idea what that means. OK, let me ask Google. Google shows me the Wikipedia site for alliums. Have I ever told you how much I love Wikipedia? So it turns out that alliums are the family of onions, garlic, chives, shallots and leeks. 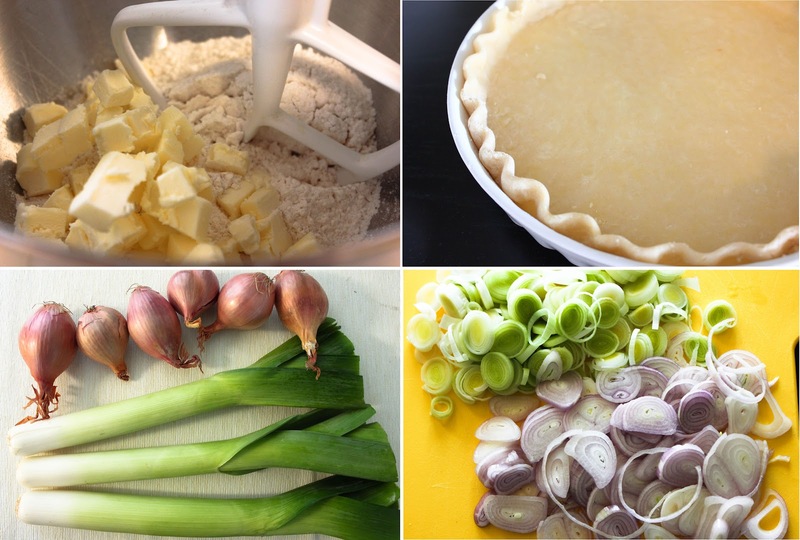 Shallots and leeks! I love shallots and leeks! I'm going to send something to this contest, and if I don't win, at least I will have invented a recipe with shallots and leeks, and I will be able to eat it. It's time to be creative my friends. I hate that word, creativity. It's on everybody's mouth right now. Like everyone has to be creative and write it on their resumes. Hey, I'm creative! I'm creating a recipe! Maybe I am the future CEO of Google. Anyway. Let me go back to the recipe. So what can I make with shallots and leeks without copying the guy that is sitting in front of me? (I decided to censor the main part of the creative process, just in case you copy me and get to be Google's CEO before I do). 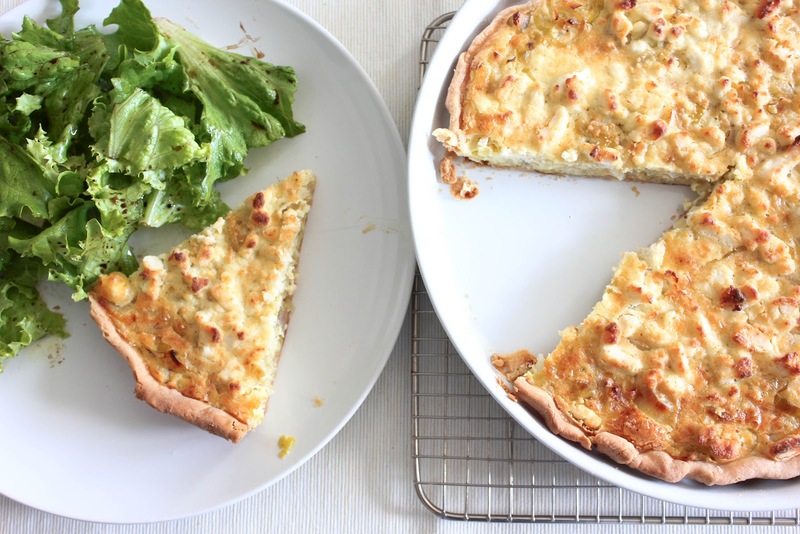 So the result is this leek and shallot quiche. This quiche is more french than any french quiche because it has Dijon mustard and goat cheese, so that makes it super french. I would say it's pretty delicious, but that's just my opinion. You know, mothers always think that their babies are the cuttest. Maybe it isn't a contest winner. Maybe it is. I'll let you know. Be creative my friends. In a big bowl, mix the flour and salt. Add the butter and mix well (you can use a stand mixer or a wooden spoon or your hands). At this point, the texture will be like coarse sand. Add the egg and keep mixing. Now the dough has to be sticking together a little more. Add 2 tablespoons of cold water, one at a time, and keep mixing. Scrape the dough onto a clean surface and knead a little bit with your hands. Form the dough into a ball and then flatten it to make a thick disk. Cover it with plastic wrap and refrigerate for a minimum of 1 hour. When you are ready to prebake the shell, take it out of the refrigerator and remove the plastic wrap. On a floured surface, roll the dough until you have a 12inch/ 30 cm circle. 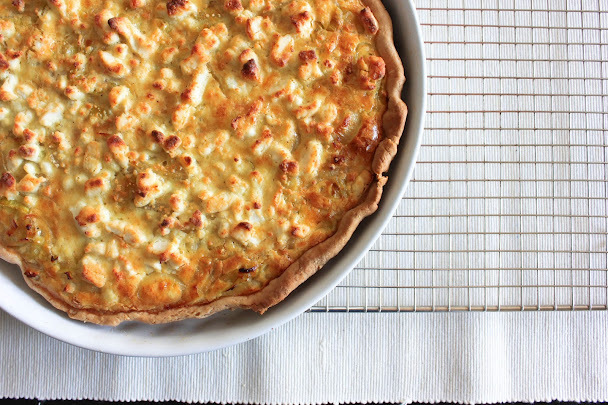 Place the dough in a buttered tart pan and press it over the walls of the pan. Using a rolling pin cut excess dough against the tart pan. Place a circle of parchment paper over the shell and cover it with pie weights or beans. Bake for 15 minutes, until very lighty golden. Heat 4 tablespoons of olive oil in a heavy skillet. Add the leeks and the shallots and cook over medium heat for 10 minutes, until very soft. In a medium bowl, beat the eggs. Add the heavy cream, nutmeg, mustard, salt and pepper and whisk to blend. 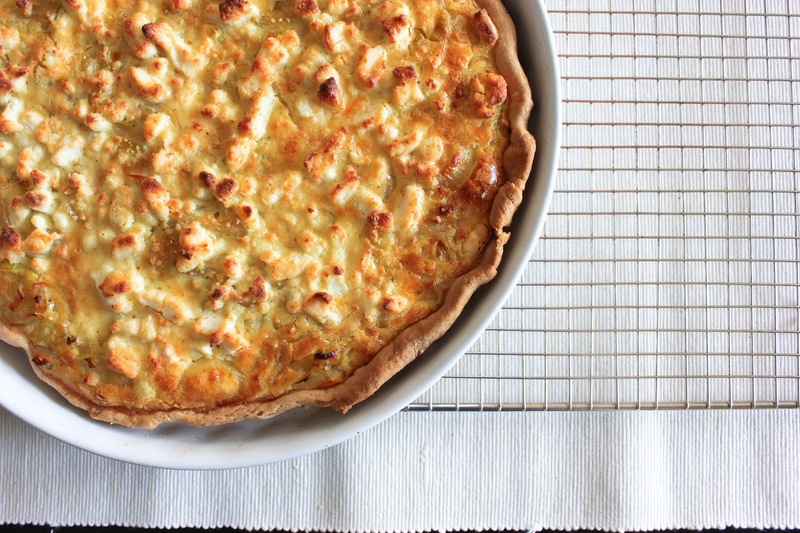 Spread the leeks and shallots over the prebaked tart shell. Pour the cream and egg mixture over, until it reaches the edge of the shell (discard any leftover mixture). Sprinkle the goat cheese crumbs over. Bake for 35 min, or until the surface is light golden. Let it cool a little bit, cut and serve with green salad. Say Oh la la. Thank Jessica! See you later!